Are you ready for Bath & Body Works Black Friday 2019 and Cyber Monday? We bring you info about the biggest and best deals and discounts here when the savings are announced online or in an advertisement for Black Friday and Cyber Monday 2019. We are committed to helping you find the best shopping deals of the year from Amazon Prime Day to Thanksgiving Weekend. So get ready to save in 2019, 2020 and beyond! Whether you are looking to restock your soap and shampoo for next year or you are buying presents for your family, Bath & Body Works has some great deals over Thanksgiving. We know that everything in the store is on sale, with Buy 3 Get 3 across the entire store (some exclusions may apply), but this ad is significant because you can get a 7 piece tote bag, including some items that may not be currently available by themselves. 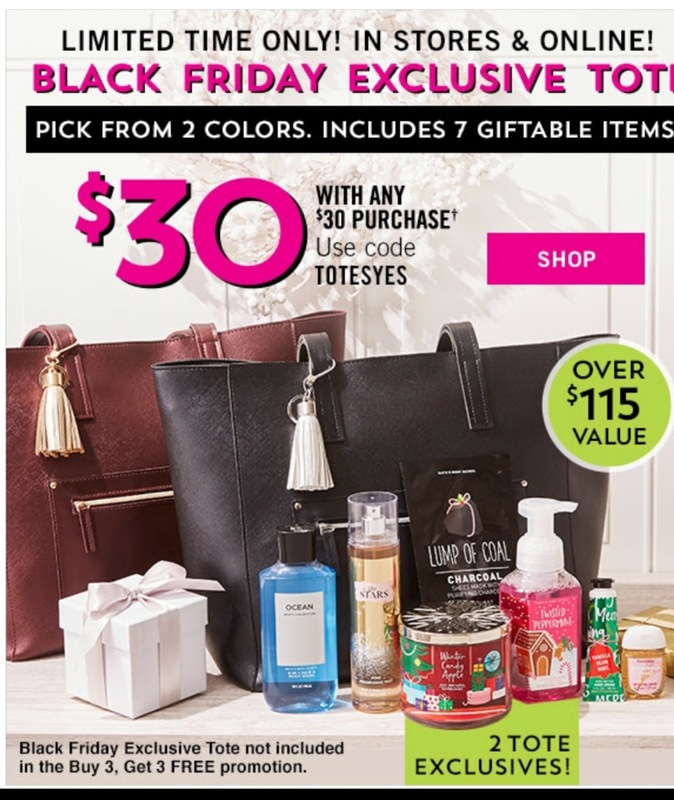 This year, starting on Black Friday, the tote includes a Winter Candy Apple 3-wick candle, Lump of Coal charcoal sheet mask, Twisted Peppermint foam hand soap, Ocean Men’s Collection body wash, Champagne Toast PocketBac (1 fl oz), In the Stars fragrance mist, and Vanilla Bean Noel hand creme – over $115 in value. We expect it will be about $25-30 with a $30 purchase, as in past years. Last year’s tote included 7 must-haves: Aromatherapy Recharge Moisturizing Body Cream (8 oz), Aromatherapy Recharge Body Wash & Foam Bath (10 oz), Heart of Gold Shea Butter Hand Cream (1 fl oz), Winter Candy Apple Super Smooth Body Lotion (3 fl oz), Winter Candy Apple PocketBac (1 fl oz), Silver PocketBac Clip and Champagne Toast 3-Wick Candle. There’s a limit of one per order, and you can order them online with promo code TOTETIME ($25 with $30 purchase, while supplies last). Check your local store’s hours, as some locations open at 6pm on Thanksgiving while others don’t open until 5 am or 6am Friday or even a little later. Online shopping is another option, with early access shopping starting 11/22 and most Black Friday deals continuing through Friday or while supplies last. We will update with the Cyber Monday 2018 ad when we have it in November from Bath & Body Works. Bath and Body Works also made it simple for Black Friday last year. The entire store (with some exclusions) was buy 3, get 3 free. Many stores opened at 6 PM on Thursday evening for the event. The Bath and Body Works Black Friday sale was also available online starting on Thanksgiving. For those who were looking to make a smaller purchase, the Cyber Monday deal a few days later had a coupon code available that took 25% off your entire online order at checkout.